William Shakespeare had a way with words. Take those words and apply them to the concealment of pistols on one’s body and it opens a myriad of possibilities. Is the pistol to big, to small, to light, to heavy or is the individual wishing to conceal it to big, to small, to light or too heavy? That is the question! Both the size of the pistol and the size of the person concealing it determines the ease or discomfort one will experience. Take me as an example. 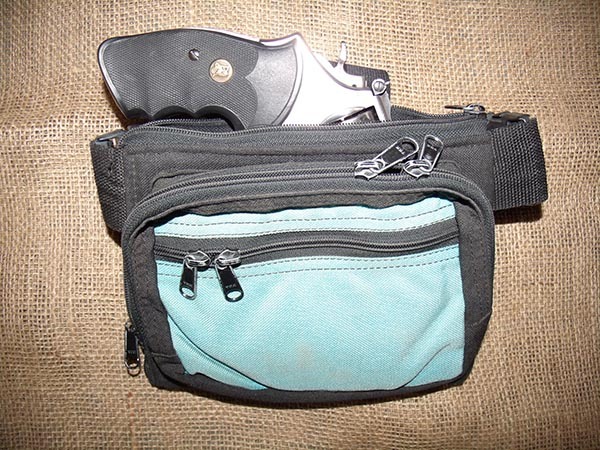 Several months ago, I wrote a series called Ditch the Concealed Carry Purse – The Importance of On-Body Carry! Wearing and concealing a pistol I tried the fanny pack and pocket carry, belly band, corset and compression clothing, bra, waist, thigh and ankle holsters. Ultimately, I chose the concealed carry shirt, tank top and waist holster as the most comfortable and the easiest to retrieve my pistol. I’m 5’4” 135 lbs. and per my husband, shaped like an Apple as seen in Photo #1. 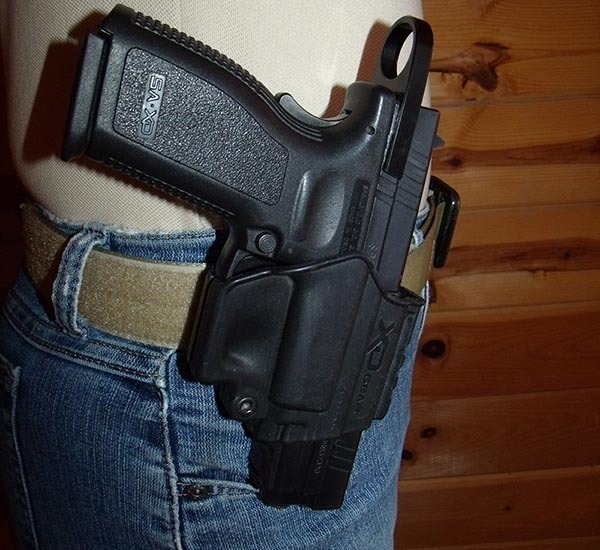 My choice of pistol and my shape determines which concealed carry method works for me. 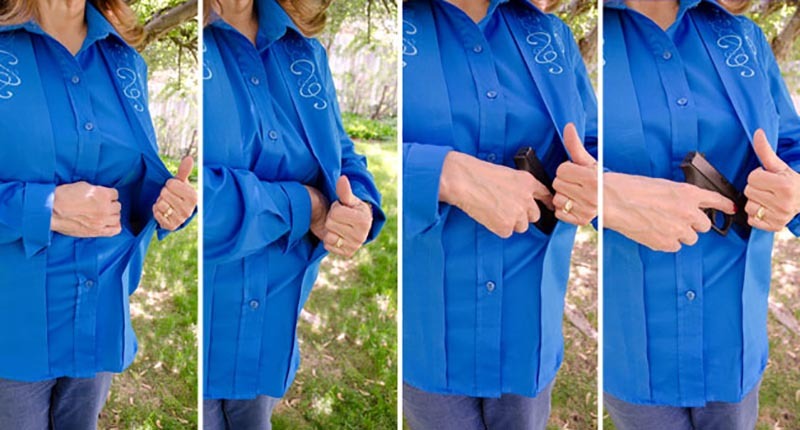 My choice of clothing over the concealed method can determine the speed of the retrieval of the pistol from concealed carry. My challenge in this article is to research different pistols, and examine strengths and weaknesses for On-Body Concealment. The purpose is to determine whether certain pistols are “To Be or Not to Be – Concealed.” I’m looking at these pistols as possibilities for the shirt, tank top and waist holster I previously chose as my preference. Perhaps the pistols I’ve chosen to research may be acceptable in the other methods of carry, but that could only be determined by the individual’s specific body shape, the concealed carry method and their clothing. It’s difficult to choose a firearm without first trying it out. It’s difficult to choose an On-Body Conceal Carry method without trying it out with the pistol of your choice. So, my suggestion is to obtain the pistol first, and the concealed carry method second. It would be a waste of money to buy the fanny pack for a .380 automatic and try to force a .357 revolver into it. Likewise, the reverse would be just as bad. 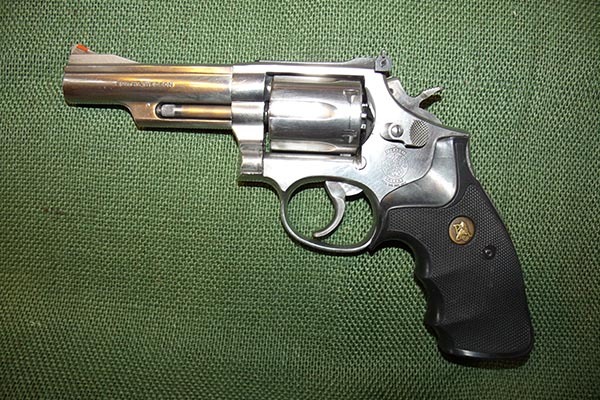 This Charter Arms .38 revolver is called the Tiger II. It is built on the popular Undercover Lite frame. 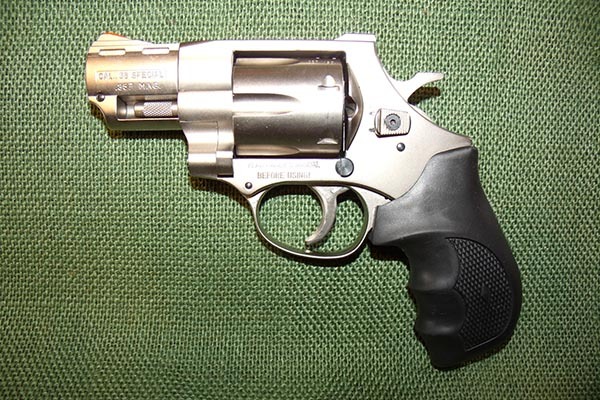 The 5-shot .38 Special revolver features a 2” barrel, fixed sights and traditional spurred hammer. It can fire both single and double action. Constructed of tough, aircraft-grade aluminum and steel, it is rugged and weighs 16 oz. I could have chosen many of the other “Guns of Color,” but their weight were only 12 oz., with an overall length of 6.5”. I chose the 16 oz. Tiger II because I knew that the additional weight, though not much, would reduce the recoil. The only other Charter Arm that was heavier, was the 21 oz. Tiger in .44 Special. Too much gun for me. Strengths: Small, light, assorted colors, easily concealed. Weaknesses: Only holds 5 rds., short sight-radius, smaller sized sights, recoil is painful to center-web of hand. The EAA Windicator is a .357 Magnum/.38 Special, considered a compact pistol, with a single/double action. It holds 6 rounds of ammunition, a 2” barrel, with a full length of 7”. It weighs 30 oz., has fixed sights with a standard rubberized grip and trigger. Strengths: It fills your grip and has less muzzle flip during recoil. Heavier with more control, less recoil, and can accommodate more powerful ammunition. Sights are prominent. Weaknesses: Bulkier and more difficult to conceal, not as attractive to the eye, less feminine in appearance, short sight-radius, heavy. 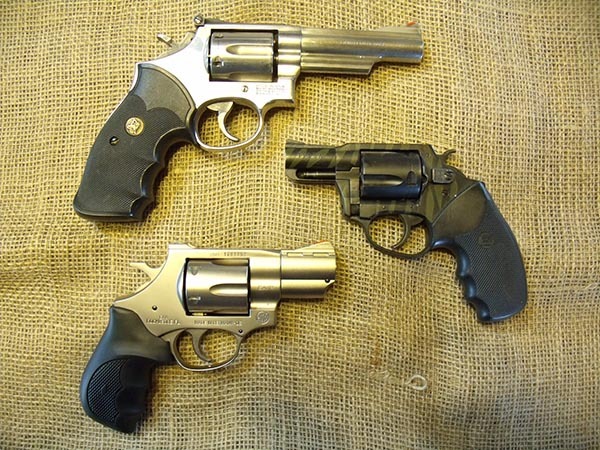 The Smith & Wesson Model 66 is a K-Frame revolver and built specifically to handle the .38 S&W Special Cartridge. The Model 66 can fire a .357 Magnum or a .38 Special + P. It has a round capacity of 6, a barrel length of 4.25”, overall length of 9.6”. It has Single/Double Action, a synthetic grip (which I changed to rubberized), stainless steel barrel, cylinder and frame. It weighs 36.9 oz. Strengths: Excellent grip for large hands and for those women that need placement for all their fingers, easily controllable recoil, long sight radius. Front sight is red ramp and rear sight is white outline and adjustable. Weaknesses: More difficult to conceal, heavy. 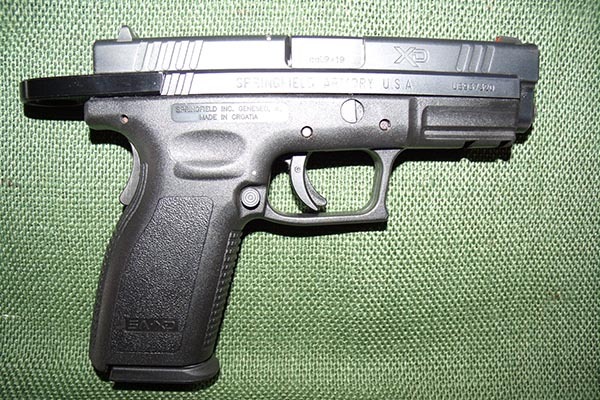 The Taurus PT111 G2 9mm semi-auto, has a 3.2” barrel. Its overall length is 6.2”, height is 5.1” and width is 1.2”. It weighs 20.8 oz. and is made of Blue or Matte Stainless Steel. The slide is alloy steel, barrel is stainless steel and the grip is polymer. The G2 has a striker firing mechanism which normally operates as a single action system. If there’s an ammunition failure and a misfire occurs the system automatically goes to a double action condition allowing you to fire again without cycling the slide manually. The magazine has a 12-round capacity double-stack magazine. I purchased this pistol because when I picked it up, it felt perfect in my hand. I had a place for all my fingers and the roughness of the grip prevented slippage during recoil. Strengths: Grip comfort, slippage resistant, easily concealable, comfortable magazine capacity, single/double action capability. Weaknesses: Rough textured grip irritates skin; strong slide spring requires more strength to manipulate. The Walther CCP 9mm semi-auto, has a 3.54” barrel. It is 5.12” in Height, 1.18” in Width, overall Length of 6.41”. It carries 8 rounds in the single-stack magazine and has a Trigger Pull of 5.5 lbs. It has 3-dot Polymer sights of which the rear sight is adjustable. 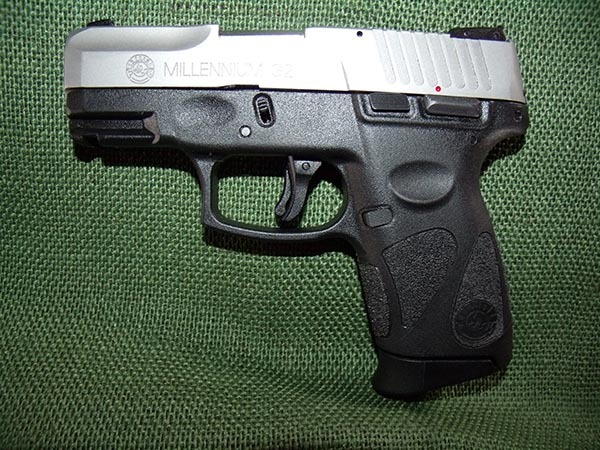 It weighs 22.33 oz., and comes in Cerakote Black or Stainless Steel. The gas-delayed blow-back system allows for an easy cocking slide. The Manual thumb safety and firing pin block are for safe carry. Strengths: Easier for women to manipulate the slide, women like the manual thumb safety and non-slip and cross-directional grip surface. It is easily concealable and sights are low profile – won’t snag clothing, Picatinny rail for flashlight or laser. Weaknesses: Difficult reassembly after cleaning, looks blocky, sight dots are not prominent, currently under recall due to drop safety issues. 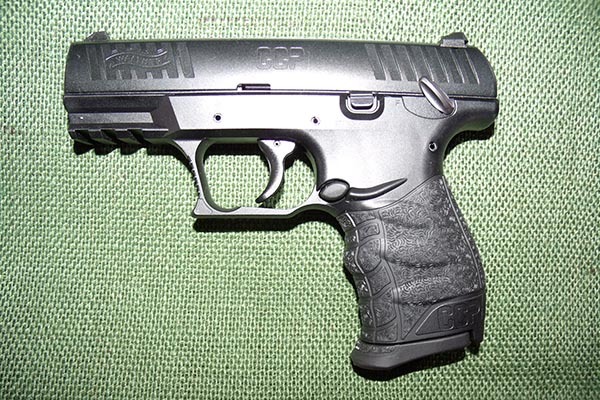 The Springfield XD9 is a 9mm semi-auto. 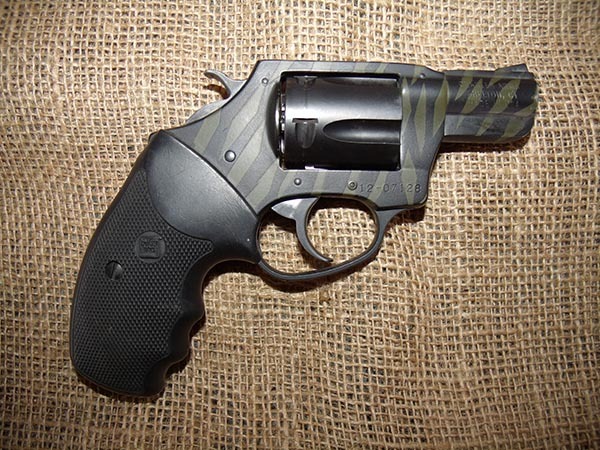 It has a 4.25” barrel, overall height of 5.5”, overall length of 7.3” and overall width of 1.2”. The XD9 weighs 28 oz. The sights are Dovetail front and rear, 3-dot, polymer grip, black polymer frame, double-stack magazine capacity of 16 round. Strengths: A comfortable grip with grip safety as well as trigger safety. Prominent 3-dot sights. Comes with retention holster, double magazine carrier for my belt and a magazine loader. Can be fitted with a Brass-stacker Slide Pull to ease the manipulation of the slide. Weaknesses: With full magazine, pistol is heavy, the longest in length of those pistols evaluated. This may preclude usage in come concealed carry methods. 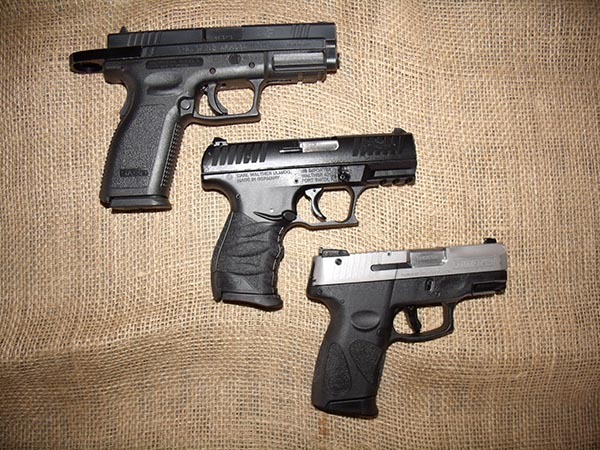 Naturally the Charter Arms Tiger II, the Taurus G2 and the Walther CCP would be the best for concealed carry. With the shorter barrel length of 2”, 3.2”, 3.54” and the shorter overall length of 6.4”, 6.48”, 6.5” as well as their lighter weight, these would be the natural choice. Easily concealed in the shirt, tank top and waist holster. However, as I’ve mentioned in other articles, small is not necessarily the best. My choice would be the .357 Windicator, the S&W M66 and the Springfield XD9. Some women prefer and carry the longer length, bulkier pistols. Perhaps not as easy to Conceal On-Body, women may need something powerful to stop a bear, a vicious dog or a rabid skunk. They also understand that a perpetrator on drugs/alcohol may not respond to a smaller caliber. Some women feel more safe and powerful with a big pistol. And with that confidence in the firearm comes the competence in its usage. 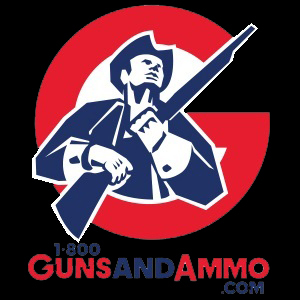 All pistols have strengths and weaknesses, no matter what manufacturer or caliber. 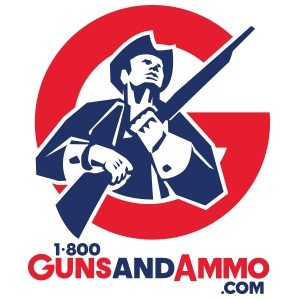 What is important is the choice of pistol, the concealed carry method, the body shape that will wear it, and the environment in which the pistol will be carried. To Be or Not to Be – Concealed? It’s your choice.